I write to you with great displeasure at your treatment of my nationality. When I read the Fuzzy Five, I always read it out loud. When I do, I give Nina Jr. a strong French accent. This comically overdrawn accent is offensive, as is the stereotype that all French women are aquatic mammals with large horns growing from their foreheads. For the sake of my grandmother, please release the Fuzzy Five in print. Very, very large print. Preferably in the Lincoln Chronicle-Journal. MY NAME IS SIR JONATHAN MAZUMBO AND I AM THE SON OF GENERAL CICERO MAZUMBO, MINISTER OF MINES AND APPETIZING FOR THE FEDERAL REPUBLIC OF NIGERIA. YOU COME HIGHLY RECCOMENDED AS A RELIABLE AND TRUSTWORTHY CEPHALOPOD WHO CAN HELP ME WITH A LUCRATIVE BUSINESS OPPORTUNITY. CURRENTLY, MY FAMILY HAS US$23 MILLION IN A BANK ACCOUNT FOR WHICH WE NEED A RECIEVER IN UNITED STATES. IN EXCHANGE FOR YOUR HELP, WE WILL GIVE YOU TEN PERCENT OF THE PROCEEDS. EMAIL ME BACK IF INTERESTED AT MAZUMBO292@YAHOO.COM. Tech Support Tiger is racist. I’m not sure why, but it must be. For Christmas, my mother sent me a Squishable Fox just like the character Spirit in your comic. For hours and hours, I sat with her and tried to convince her that I would not freak out if she talked to me. I left her with a pen and paper, but she could not even bring herself to write a note. Does Squishable send out foxes who hate their humans, or have you been lying about their ability to talk and get involved in improbable adventures? In either case, you are despicable and I will report you to your state Department of Consumer Protection. Just as soon as I figure out what state Fluffton is in. Is there supposed to be a footnote to “halibut-eating”? This is my new favorite strip. It is adorable, hilarious and fun and has a rage meter. 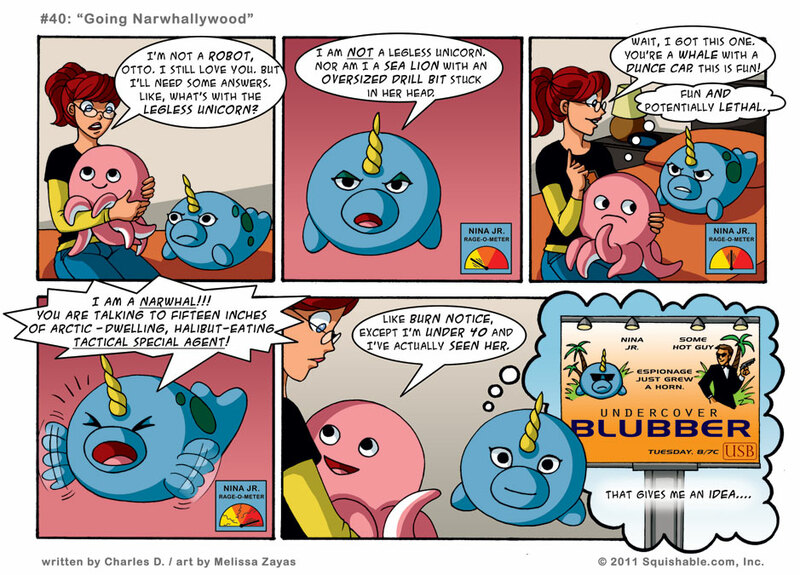 Narwhal power! Well played, Charles. I think thats the first time anyone wrote the words”halibut-eating tactical special agent” in the history of the human race. I love the Burn Notice reference… but for the record I think its a great show and I’m fairly well under 40! Also, Some Hot Guy was really hot in that movie. can i snorgle otto, claire, and nina jr.? ‘cos that sounds like a lot of fun. I love Otto’s little arms draped over Claire. Cute. hey! Burn notice is actually quite good. or was quite good. esp when i had cable and could still watch it. and i’m under 30. Sorry, that’s a typo. There is no footnote.